If the true spirit of the holidays is love, generosity and acceptance of others, then Fairmont students are no grinches. For the 11th consecutive year, kids from all five of Fairmont's preschool-12th grade campuses collected toys for the children of CHOC hospital and handed them over to 45 santas-on-wheels from the OC HOG chapter on Friday, December 10. 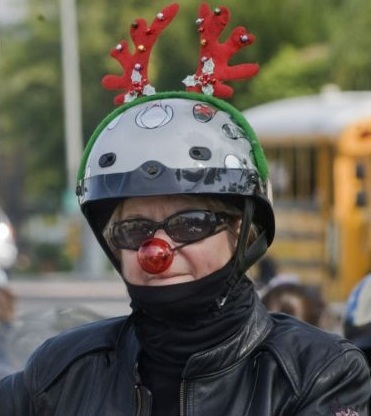 This year's Toy Run was a huge success thanks to the generosity of Fairmont's students, teachers and staff and the coordinating efforts of Judy Coderre, Fairmont's Reprographics Department Manager. Read the OC Register's coverage of the event at the Anaheim Hills campus and the Edgewood campus. I bwlieve Faimront's annual tradition of collecting gifts for the choldren in the hospital is a wonderful idea. I'm sure the simple act of purchasing a small gift heavily impacted many of the children in the hospital. The toy drive is something I always look forward to and I hope the tradition continues.